On “Turn to Darkness,” he choose a simple riff and a hard rocking sound. His voice is big and rich, and the chorus shines with high notes that run shivers down your spine. The guitar solo is excellent—a string-burying display of technique. “Last Chance to Love” is a great AOR song. The mood is stuck somewhere between somber and confident, with an extended chorus, touching on tender moments. “Fortune Hunter” is a slower song with a lot of emotions. Hank’s vocals are poignant and with the perfect amount of vibrato, showcasing one of the better voices out there in the genre today. “Way to Go” is a slower song with that cast of somberness that just hangs throughout, admonishing a girl who “lives her life in vein, and on the run.” The lyrics could be a little better here, but you get the point. “Affairs of the Heart” features the talents of Linnea Vikström (THERION) on vocals. The vocal parts are sung as harmonies and sometimes she takes the leads as well. She brings a fire to the table for sure. “Electricity” has a great opening sequence, reflecting the chorus in big, bright tones that put an ever-lasting smile on your face. It’s probably the best song on the album in terms of the impact that it makes. This one is a “sing-along” for sure. “Freak” uses liberal doses of keys in a fairly depressing sound overall. He sings with real emotion here, pleading “I wouldn’t be a freak if you would help me.” “Giving up on Love” has a grand entrance, leading to a big chorus where a key change signals them dialing it up to really create something memorable. “For the Restless and the Youth” is the final track, opening with simple acoustic guitar and vocals. Hank sings from his heart here, gradually increasing through a crescendo at the end. Overall, this was a very good album, made even better by the guest musicians, who brought expertise to the table. 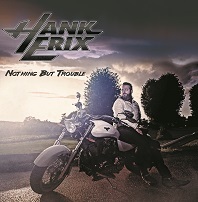 It’s clear that Hank still has the chops and songwriting vision to create something quite catchy and enduring. The songs are just somber enough to draw you in to his world, with those overtones of the greatness of yesteryear, yet many of them have positive elements as well, the very crux of what the AOR genre is all about for me. The combination makes for ten great songs, each with their own set of attractive elements. Definitely pick this up if you are in the mood for some great AOR.